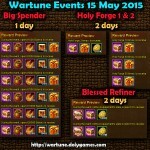 Hey everyone, in this article I share the Wartune Events for the 1st of SEP 2018 (article + video)(Gem Synthesis Cycle). This event cycle offers chance to upgrade Gems and Identify & Refine clothing. Due to costs most trades are not interesting. Maybe consider only the 100 Magic Mirror for 100 Talent Stones; 2nd maybe – 100 for Wraithstones (depending if there are other, more interesting, places to trade event chests). Is gem master really giving that old item? hi cosmos, i think its 100 blood claws for 100 talent stones, looks pretty good. Hi, yes, it can be if there is nothing else that you want for the event items. Why I personally don’t use that is because as you go higher in level you need massive amounts of talent stones for just 1 level, so for example 6000 for level 30, which means you’d have to use 600 event chests for just 1 level and I am not sure if that’s worth it. I think it is more worth it for people who PvP a lot but if you are not a competitive PvPer then i think the event chests are better spent elsewhere.